Musical talent doesn't go unnoticed here – with elite awards of up to $25,000 per year. Students interested in majoring in music at Concordia will be simultaneously auditioned for acceptance into an appropriate professional music degree program (music education, performance, or composition) at the time of the music scholarship auditions. The Bachelor of Arts in Music program does not require an entrance audition. Each year, we honor select first-year and transfer students with our Music Scholarships. These four-year scholarships are awarded in piano, voice, guitar, strings, woodwind, brass, percussion, and composition. Scholarship amounts range in value from $2,000 to $6,000 annually ($8,000 to $24,000 over four years) and are renewable each year. 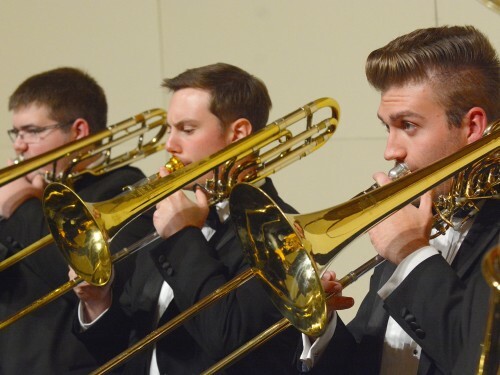 You do not need to be a music major to apply, though you will be required to take private lessons and join one of our major music ensembles in the area of your scholarship. Exceptionally talented musicians will also be considered for the Christiansen Scholarship of $25,000 annually ($100,000 over four years). To be eligible to receive a Music Scholarship, you must be an incoming student who has been accepted for admission to Concordia, and have at least a 3.0 non-weighted cumulative grade point average. Additionally, you must exhibit proficiency in vocal, instrumental or piano performance. Your initial screening will be based on the Music Scholarship application, musical resume, and an audition recording. The scholarship is guaranteed through your sophomore year and is renewable for the junior and senior years provided you maintain a 3.0 grade point average and are recommended by faculty. Most recipients of this award also qualify for additional financial and academic scholarships and grants, in which case the Music Scholarship becomes part of a larger financial aid package. Apply and be accepted to Concordia. Complete the Music Scholarship online application (now closed). Prepare a high-quality audio recording. (Your high school music teacher may be able to help.) If you are applying in more than one performance area, you only need to submit your online application ONE TIME, however, you will be able to upload a separate recording for each performance area (maximum three). Complete the Music Scholarship online application. Applicants should submit a minimum of one and a maximum of three composition scores or recordings, as well as a composition resume. Submitted works should be representative samples of the applicant's best work. Finalists will be invited to campus for an interview and an audition. You will perform individually before music faculty. You will also have an opportunity to attend band, choir and orchestra concerts, visit non-music classes, faculty in other departments and have the option of an overnight student host for your stay. A select number of Christiansen Music Scholarships of $25,000 per year are awarded annually (up to $100,000). Because of its significant value, the Christiansen Scholarship replaces all other application and merit aid awarded to the recipient. The Hvidsten Ensemble Award recognizes talented students that we wish to include in our music program through participation in major ensembles. This award is granted to accepted students and is for $1,000 a year (up to $4,000). You must participate in one of Concordia’s major ensembles to continue receiving the funds. Please note that private lessons are not required with this award, though highly recommended. All students that receive the Hvidsten Ensemble Award are then finalists for the Music Scholarship audition if those application materials are submitted before the deadline(s). Furthermore, no recording is required with your Music Scholarship materials if you send a photo of your Hvidsten Ensemble Award along with your application materials. The list of ensembles that you may sing or play in to satisfy the requirement is as follows: The Concordia Choir, Kantorei, Chapel Choir, Cantabile, The Concordia Band, Symphonic Band, The Concordia Orchestra, and Symphonia. 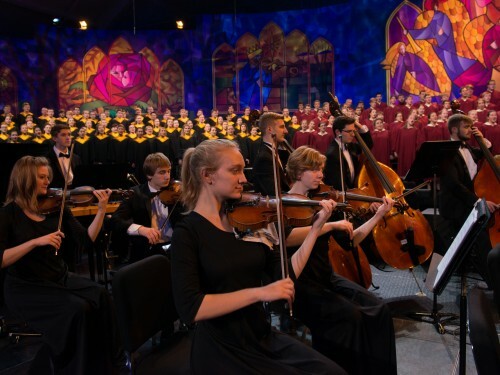 All students that have participated in a high school All-State ensemble, Lutheran Summer Music program, Minnesota All State Lutheran Choir, or a similar approved auditioned activity, are awarded the Hvidsten Ensemble Award of $1,000 per year (up to $4,000). This award is for students of any academic major, though recipients are required to participate in a major ensemble every semester they are enrolled at Concordia. Contact Michael Culloton for Vocal at culloton@cord.edu or Peter Haberman at phaberma@cord.edu for Instrumental, and present proof of participation in an all-state ensemble, Lutheran Summer Music Program, Minnesota All State Lutheran Choir, or an auditioned community group. Examples include a concert program, letter from high school director, etc. If you have already received a Hvidsten Award in the mail, apply for the Music scholarship and upload a photo of the Hvidsten Award in lieu of a recording. See the application process for the Music Scholarship detailed above. If you are awarded a Music Scholarship, that scholarship will replace the Hvidsten Award. Students must apply, be admitted to the college, and compete for the Music Scholarship to receive the Hvidsten Award. Concordia offers a variety of music majors and minors to best suit your passions. Join a choir or band ensemble during your time at Concordia to stay musically involved. Application, visit, merit, talent, community, and diversity awards and scholarships from Concordia College will be capped at $27,000. We encourage all families to complete the FAFSA to best inform our Financial Aid Office if you are eligible for additional need-based aid.